I'm not referring to the heavy from the unreasonable amount of carbs I indulged in recently. And seriously, it was an unreasonable amount. I have no self-control around a basket of warm, buttery rolls sitting on the table. It's a problem. I went to plan B, prayer, which should have been my plan A, but I'm too difficult a person to do things the easy way first. Plan B didn't really make me feel better either, to be honest. I decided that there was no fix and that I would just do what I do best, ignore it and move on. So that's what I did. My saving grace is 3:00pm. It's a time of stillness that comes after my day's obligations are winding down and just before the kids get out of school and we hit the ground running. From 3:00-3:45 I get the luxury of doing what I want. I usually spend it writing or reading. Sometimes watching reality shows (Naked & Afraid is quality programming). So as the story goes, Lazarus became very sick. His sisters watched him as he became sicker and sicker until he was so sick that he was knocking on death's door. The thing was that Jesus had left town. This was also during a time scholars refer to as B.I. (before iPhone) so Jesus wasn't exactly easy to reach. Still, Martha and Mary knew he was their best bet so they sent a message to him that simply said, "Lazarus is ill." Then they waited for three days for Jesus to come back, which he eventually did. By the time he got there Lazarus was already dead. The sisters took Jesus to their brother's tomb. Jesus, with a crowd watching, raised Lazarus from the dead and he walked out of the tomb. The thing that stood out to me most in this story this time, which I have heard retold many times over the years, was the letter that Mary and Martha sent to Jesus. It simply said, "Lazarus is ill."
That's it. Are you kidding me? Lazarus, my brother as you may remember, is sick. I'm really worried if he doesn't get better soon he may even die. I know you can perform miracles and healing the sick seems to be your favorite so can I ask you to consider coming back and helping him? I know you just left town and it's so far out of your way, but please come back. I'll come up with the money to pay for the expenses incurred from turning your donkey back around. Please come back quickly because he doesn't have much time. He's getting sicker by the minute. You can find him here at our house when you get back. I drew a map on the back of this note to help you find us easier. Can you give me a sign that you are coming back so I won't worry? Please help Lazarus. My sister is freaking out too. Please, please hurry. But all Mary and Martha's note said was, "Lazarus is ill."
Then to send that and wait 3 days without any word on if Jesus even got the message or not would have made me assume the worst. But Mary and Martha had faith that their "Lazarus is ill" message was sufficient. Their short note implies that they must have trusted he knew better how to handle the situation than they did (gasp!). I wonder if they thought it was wasting sweet time writing more than necessary or maybe they thought it would just be overkill, but whatever the reason was their simple "Lazarus is ill" note had Jesus turning around and coming back to town to help them. It makes me wonder if sometimes I feel like my prayers aren't favorably answered because Jesus didn't decide to answer them by following the instructions that I gave with my request. Had Mary and Martha told Jesus following their request that they needed him to come back that very day because they needed his help before their brother died they would have been really disappointed. They would have been at Lazarus' funeral feeling abandoned by Jesus when all the while he was on his way with full intention of healing their brother. Their simple request/heart's desire/prayer/message was heard loud and clear from Jesus. He knew exactly the perfect time and how to respond. I bet he even was proud of how much faith it took to write such a short simple message under such dire circumstances. 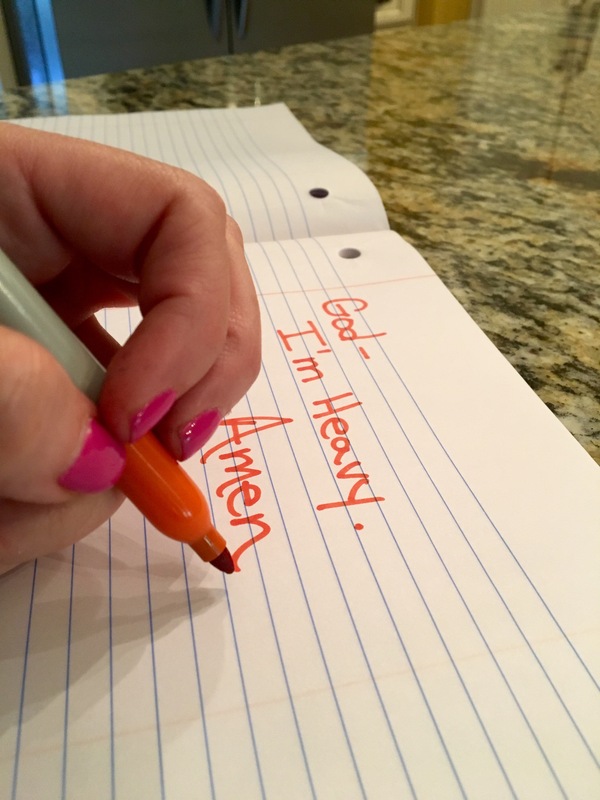 As 3:45pm approached and my quiet time was about to be shifted over to the chaos I call "my life after school lets out" I tried praying like the way Mary and Martha would have done it. I'm worried and feel heavy. I may be way off base, and lots of times I am, but I found last week that I prayed more. It felt less heavy to pray this new way. Which was my problem to begin with...heaviness. So thanks girls (this is what I call Mary and Martha now...we are tight). Your faith changed me. Thanks for having it. Thanks for including what your message said as part of the story.